Minnesota winters get very cold and chilly, but if you have a properly insulated and ventilated house, you'll be inside warm and cozy watching. The right way to save money by cutting your heating and air conditioning bills by up to 20%, is to add insulation in your attic or walls. Insulating your attic has many advantages such as cutting your energy bills, keeping heat in during winter months and heat out during the summer,it reduces ice dams, and on top of that there is a tax credit offered by the federal government for qualifying insulation purchases. "It might seem odd to add insulation for warmth and then purposely allow cold air to enter the attic through vents, but this combination is the key to a durable and energy-efficient home. Here's why: in the winter, allowing a natural flow of outdoor air to ventilate the attic helps keep it cold, which reduces the potential for ice damming (snow that melts off a roof from an attic that is too warm and then re-freezes at the gutters, causing an ice dam that can damage the roof). Proper insulation and air sealing also keeps attics cold in winter by blocking the entry of heat and moist air from below. In the summer, natural air flow in a well-vented attic moves super-heated air out of the attic, protecting roof shingles and removing moisture. The insulation will resist heat transfer into the house." 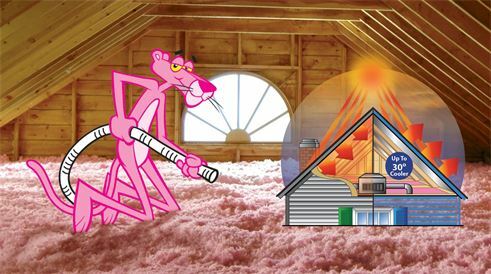 The most common mistake homeowners make when installing insulation is to block the flow of air at the eaves. NEVER cover attic soffit vents with insulation — use rafter vents and soffit vents to maintain airflow. This is where we come in to serve you and help by insulating your home making sure it's up to code and at the right level.